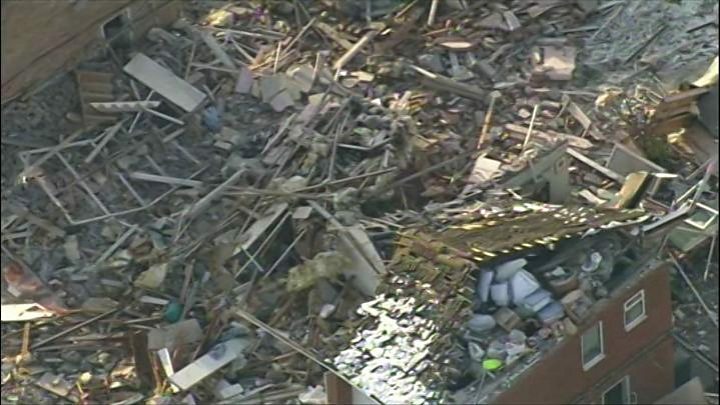 A woman has died following a gas explosion at a house in Leicestershire. Janet Jasper was taken to hospital following the blast, which happened on Allington Drive, Birstall, at about 07:30 GMT on Monday. Two men were also injured - one is in a stable condition in hospital and the other has been discharged. One house was destroyed, another torn in half and 50 others were damaged. A "handful" of families spent Monday night in temporary accommodation. The gas maintenance company Cadent, which supplied the collapsed house in Birstall, has confirmed it attended a call-out on Allington Drive on Sunday. Chris Rison, from Cadent, said: "We were called and we attended to a job on this street. "I can't go through the details of that attendance because that's all part of the investigation but it's true that we attended." The Shah family, who live next door to the demolished house, cannot return home because it is not structurally safe. Local people have offered them shelter, food and hot drinks. Tina Shah said: "We have had lots of phone calls and messages. The whole community has been fantastic." Talking about the explosion, she said: "My son was in bed with me and our roof came in. I didn't know what had happened to my daughter because she was in another room. "I am just really grateful I have been able to walk out of my house with my two children." Charnwood Borough Council said it was too early to tell if those left temporarily homeless would be able to return home before Christmas. Richard Smith, who lives three doors down from the blast site, has lost dozens of tiles and damaged windows but stayed at home on Monday night in freezing temperatures. "It is a bad state, but we are lucky. A lot of people are even worse," he said. "I can't imagine how those poor people feel. If we had lost our house like they have, I don't know what we would have done really. "I just feel terrible for them. I am just hoping and praying that they are OK."